Frame 1: The top electromagnet (1) is turned on, attracting the nearest teeth of the gear-shaped iron rotor. With the teeth aligned to electromagnet 1, they will be slightly offset from right electromagnet (2). Frame 2: The top electromagnet (1) is turned off, and the right electromagnet (2) is energized, pulling the teeth into alignment with it. This results in a rotation of 3.6° in this example. Frame 3: The bottom electromagnet (3) is energized; another 3.6° rotation occurs. Frame 4: The left electromagnet (4) is energized, rotating again by 3.6°. When the top electromagnet (1) is again enabled, the rotor will have rotated by one tooth position; since there are 25 teeth, it will take 100 steps to make a full rotation in this example. A stepper motor, also known as step motor or stepping motor, is a brushless DC electric motor that divides a full rotation into a number of equal steps. The motor's position can then be commanded to move and hold at one of these steps without any position sensor for feedback (an open-loop controller), as long as the motor is carefully sized to the application in respect to torque and speed. Switched reluctance motors are very large stepping motors with a reduced pole count, and generally are closed-loop commutated. Brushed DC motors rotate continuously when DC voltage is applied to their terminals. The stepper motor is known by its property to convert a train of input pulses (typically square wave pulses) into a precisely defined increment in the shaft position. Each pulse moves the shaft through a fixed angle. Stepper motors effectively have multiple "toothed" electromagnets arranged around a central gear-shaped piece of iron. The electromagnets are energized by an external driver circuit or a micro controller. To make the motor shaft turn, first, one electromagnet is given power, which magnetically attracts the gear's teeth. When the gear's teeth are aligned to the first electromagnet, they are slightly offset from the next electromagnet. This means that when the next electromagnet is turned on and the first is turned off, the gear rotates slightly to align with the next one. From there the process is repeated. Each of those rotations is called a "step", with an integer number of steps making a full rotation. In that way, the motor can be turned by a precise angle. Permanent magnet motors use a permanent magnet (PM) in the rotor and operate on the attraction or repulsion between the rotor PM and the stator electromagnets. Variable reluctance (VR) motors have a plain iron rotor and operate based on the principle that minimum reluctance occurs with minimum gap, hence the rotor points are attracted toward the stator magnet poles. Whereas hybrid synchronous are a combination of the permanent magnet and variable reluctance types, to maximize power in a small size. There are two basic winding arrangements for the electromagnetic coils in a two phase stepper motor: bipolar and unipolar. A unipolar stepper motor has one winding with center tap per phase. Each section of windings is switched on for each direction of magnetic field. Since in this arrangement a magnetic pole can be reversed without switching the direction of current, the commutation circuit can be made very simple (e.g., a single transistor) for each winding. Typically, given a phase, the center tap of each winding is made common: giving three leads per phase and six leads for a typical two phase motor. Often, these two phase commons are internally joined, so the motor has only five leads. A micro controller or stepper motor controller can be used to activate the drive transistors in the right order, and this ease of operation makes unipolar motors popular with hobbyists; they are probably the cheapest way to get precise angular movements. For the experimenter, the windings can be identified by touching the terminal wires together in PM motors. If the terminals of a coil are connected, the shaft becomes harder to turn. One way to distinguish the center tap (common wire) from a coil-end wire is by measuring the resistance. Resistance between common wire and coil-end wire is always half of the resistance between coil-end wires. This is because there is twice the length of coil between the ends and only half from center (common wire) to the end. 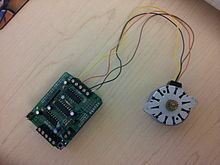 A quick way to determine if the stepper motor is working is to short circuit every two pairs and try turning the shaft. Whenever a higher than normal resistance is felt, it indicates that the circuit to the particular winding is closed and that the phase is working. Bipolar motors have a single winding per phase. The current in a winding needs to be reversed in order to reverse a magnetic pole, so the driving circuit must be more complicated, typically with an H-bridge arrangement (however there are several off-the-shelf driver chips available to make this a simple affair). There are two leads per phase, none are common. A typical driving pattern for a two coil bipolar stepper motor would be: A+ B+ A- B-. I.e. drive coil A with positive current, then remove current from coil A; then drive coil B with positive current, then remove current from coil B; then drive coil A with negative current (flipping polarity by switching the wires e.g. with an H bridge), then remove current from coil A; then drive coil B with negative current (again flipping polarity same as coil A); the cycle is complete and begins anew. Static friction effects using an H-bridge have been observed with certain drive topologies. Dithering the stepper signal at a higher frequency than the motor can respond to will reduce this "static friction" effect. Because windings are better utilized, they are more powerful than a unipolar motor of the same weight. This is due to the physical space occupied by the windings. A unipolar motor has twice the amount of wire in the same space, but only half used at any point in time, hence is 50% efficient (or approximately 70% of the torque output available). Though a bipolar stepper motor is more complicated to drive, the abundance of driver chips means this is much less difficult to achieve. Bipolar with series windings. This gives higher inductance but lower current per winding. Bipolar with parallel windings. This requires higher current but can perform better as the winding inductance is reduced. Multi-phase stepper motors with many phases tend to have much lower levels of vibration. While they are more expensive, they do have a higher power density and with the appropriate drive electronics are often better suited to the application. Stepper motor performance is strongly dependent on the driver circuit. Torque curves may be extended to greater speeds if the stator poles can be reversed more quickly, the limiting factor being a combination of the winding inductance. To overcome the inductance and switch the windings quickly, one must increase the drive voltage. This leads further to the necessity of limiting the current that these high voltages may otherwise induce. An additional limitation, often comparable to the effects of inductance, is the back-EMF of the motor. As the motor's rotor turns, a sinusoidal voltage is generated proportional to the speed (step rate). This AC voltage is subtracted from the voltage waveform available to induce a change in the current. L/R driver circuits are also referred to as constant voltage drives because a constant positive or negative voltage is applied to each winding to set the step positions. However, it is winding current, not voltage that applies torque to the stepper motor shaft. The current I in each winding is related to the applied voltage V by the winding inductance L and the winding resistance R. The resistance R determines the maximum current according to Ohm's law I=V/R. The inductance L determines the maximum rate of change of the current in the winding according to the formula for an inductor dI/dt = V/L. Thus when controlled by an L/R drive, the maximum speed of a stepper motor is limited by its inductance since at some speed, the voltage U will be changing faster than the current I can keep up. In simple terms the rate of change of current is L / R (e.g. a 10 mH inductance with 2 ohms resistance will take 5 ms to reach approx 2/3 of maximum torque or around 24 ms to reach 99% of max torque). To obtain high torque at high speeds requires a large drive voltage with a low resistance and low inductance. With an L/R drive it is possible to control a low voltage resistive motor with a higher voltage drive simply by adding an external resistor in series with each winding. This will waste power in the resistors, and generate heat. It is therefore considered a low performing option, albeit simple and cheap. Modern voltage-mode drivers overcome some of these limitations by approximating a sinusoidal voltage waveform to the motor phases. The amplitude of the voltage waveform is set up to increase with step rate. If properly tuned, this compensates the effects of inductance and back-EMF, allowing decent performance relative to current-mode drivers, but at the expense of design effort (tuning procedures) that are simpler for current-mode drivers. Chopper drive circuits are referred to as constant current drives because they generate a somewhat constant current in each winding rather than applying a constant voltage. On each new step, a very high voltage is applied to the winding initially. This causes the current in the winding to rise quickly since dI/dt = V/L where V is very large. The current in each winding is monitored by the controller, usually by measuring the voltage across a small sense resistor in series with each winding. When the current exceeds a specified current limit, the voltage is turned off or "chopped", typically using power transistors. When the winding current drops below the specified limit, the voltage is turned on again. In this way, the current is held relatively constant for a particular step position. This requires additional electronics to sense winding currents, and control the switching, but it allows stepper motors to be driven with higher torque at higher speeds than L/R drives. Integrated electronics for this purpose are widely available. 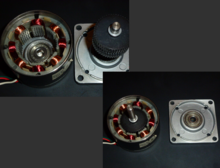 Different drive modes showing coil current on a 4-phase unipolar stepper motor. A stepper motor is a polyphase AC synchronous motor (see Theory below), and it is ideally driven by sinusoidal current. A full-step waveform is a gross approximation of a sinusoid, and is the reason why the motor exhibits so much vibration. Various drive techniques have been developed to better approximate a sinusoidal drive waveform: these are half stepping and microstepping. In this drive method only a single phase is activated at a time. It has the same number of steps as the full-step drive, but the motor will have significantly less than rated torque. It is rarely used. The animated figure shown above is a wave drive motor. In the animation, rotor has 25 teeth and it takes 4 steps to rotate by one tooth position. So there will be 25×4 = 100 steps per full rotation and each step will be 360/100 = 3.6 degrees. This is the usual method for full-step driving the motor. Two phases are always on so the motor will provide its maximum rated torque. As soon as one phase is turned off, another one is turned on. Wave drive and single phase full step are both one and the same, with same number of steps but difference in torque. When half-stepping, the drive alternates between two phases on and a single phase on. This increases the angular resolution. The motor also has less torque (approx 70%) at the full-step position (where only a single phase is on). This may be mitigated by increasing the current in the active winding to compensate. The advantage of half stepping is that the drive electronics need not change to support it. In animated figure shown above, if we change it to half-stepping, then it will take 8 steps to rotate by 1 teeth position. So there will be 25×8 = 200 steps per full rotation and each step will be 360/200 = 1.8°. Its angle per step is half of the full step. What is commonly referred to as microstepping is often sine–cosine microstepping in which the winding current approximates a sinusoidal AC waveform. Sine–cosine microstepping is the most common form, but other waveforms can be used. Regardless of the waveform used, as the microsteps become smaller, motor operation becomes more smooth, thereby greatly reducing resonance in any parts the motor may be connected to, as well as the motor itself. Resolution will be limited by the mechanical stiction, backlash, and other sources of error between the motor and the end device. Gear reducers may be used to increase resolution of positioning. Step size repeatability is an important step motor feature and a fundamental reason for their use in positioning. Example: many modern hybrid step motors are rated such that the travel of every full step (example 1.8 degrees per full step or 200 full steps per revolution) will be within 3% or 5% of the travel of every other full step, as long as the motor is operated within its specified operating ranges. Several manufacturers show that their motors can easily maintain the 3% or 5% equality of step travel size as step size is reduced from full stepping down to 1/10 stepping. Then, as the microstepping divisor number grows, step size repeatability degrades. At large step size reductions it is possible to issue many microstep commands before any motion occurs at all and then the motion can be a "jump" to a new position. A step motor can be viewed as a synchronous AC motor with the number of poles (on both rotor and stator) increased, taking care that they have no common denominator. Additionally, soft magnetic material with many teeth on the rotor and stator cheaply multiplies the number of poles (reluctance motor). Modern steppers are of hybrid design, having both permanent magnets and soft iron cores. To achieve full rated torque, the coils in a stepper motor must reach their full rated current during each step. Winding inductance and counter-EMF generated by a moving rotor tend to resist changes in drive current, so that as the motor speeds up, less and less time is spent at full current — thus reducing motor torque. As speeds further increase, the current will not reach the rated value, and eventually the motor will cease to produce torque. This is the measure of the torque produced by a stepper motor when it is operated without an acceleration state. At low speeds the stepper motor can synchronize itself with an applied step frequency, and this pull-in torque must overcome friction and inertia. It is important to make sure that the load on the motor is frictional rather than inertial as the friction reduces any unwanted oscillations. The pull-in curve defines an area called the start/stop region. Into this region, the motor can be started/stopped instantaneously with a load applied and without loss of synchronism. The stepper motor pull-out torque is measured by accelerating the motor to the desired speed and then increasing the torque loading until the motor stalls or misses steps. This measurement is taken across a wide range of speeds and the results are used to generate the stepper motor's dynamic performance curve. As noted below this curve is affected by drive voltage, drive current and current switching techniques. A designer may include a safety factor between the rated torque and the estimated full load torque required for the application. Synchronous electric motors using permanent magnets have a resonant position holding torque (called detent torque or cogging, and sometimes included in the specifications) when not driven electrically. Soft iron reluctance cores do not exhibit this behavior. When the motor moves a single step it overshoots the final resting point and oscillates round this point as it comes to rest. This undesirable ringing is experienced as motor vibration and is more pronounced in unloaded motors. An unloaded or under loaded motor may, and often will, stall if the vibration experienced is enough to cause loss of synchronisation. Stepper motors' nameplates typically give only the winding current and occasionally the voltage and winding resistance. The rated voltage will produce the rated winding current at DC: but this is mostly a meaningless rating, as all modern drivers are current limiting and the drive voltages greatly exceed the motor rated voltage. Datasheets from the manufacturer often indicate Inductance. Back-EMF is equally relevant, but seldom listed (it is straightforward to measure with an oscilloscope). These figures can be helpful for more in-depth electronics design, when deviating from standard supply voltages, adapting third party driver electronics, or gaining insight when choosing between motor models with otherwise similar size, voltage, and torque specifications. A stepper's low-speed torque will vary directly with current. How quickly the torque falls off at faster speeds depends on the winding inductance and the drive circuitry it is attached to, especially the driving voltage. Steppers should be sized according to published torque curve, which is specified by the manufacturer at particular drive voltages or using their own drive circuitry. Dips in the torque curve suggest possible resonances, whose impact on the application should be understood by designers. Step motors adapted to harsh environments are often referred to as IP65 rated. The US National Electrical Manufacturers Association (NEMA) standardises various aspects of stepper motors. They are typically referred with NEMA DD, where DD is the diameter of the faceplate in inches multiplied by 10 (e.g., NEMA 17 has a diameter of 1.7 inches). There are further specifiers to describe stepper motors, and such details may be found in the ICS 16-2001 standard (section 4.3.1.1). There are also useful summaries and further information on the Reprap site. Computer controlled stepper motors are a type of motion-control positioning system. They are typically digitally controlled as part of an open loop system for use in holding or positioning applications. In the field of lasers and optics they are frequently used in precision positioning equipment such as linear actuators, linear stages, rotation stages, goniometers, and mirror mounts. Other uses are in packaging machinery, and positioning of valve pilot stages for fluid control systems. Commercially, stepper motors are used in floppy disk drives, flatbed scanners, computer printers, plotters, slot machines, image scanners, compact disc drives, intelligent lighting, camera lenses, CNC machines and, more recently, in 3D printers. ^ Liptak, Bela G. (2005). Instrument Engineers' Handbook: Process Control and Optimization. CRC Press. p. 2464. ISBN 978-0-8493-1081-2. ^ Tarun, Agarwal. "Stepper Motor – Types, Advantages & Applications". 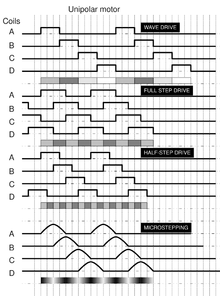 ^ "Microstepping: Myths and Realities - MICROMO". www.micromo.com. ^ "Advanced Micro Systems - stepper 101". www.stepcontrol.com. Zaber Microstepping Tutorial. Retrieved on 2007-11-15. Stepper System Overview. Retrieved on 2012-3-01. Animation of a stepping motor from Nanotec.